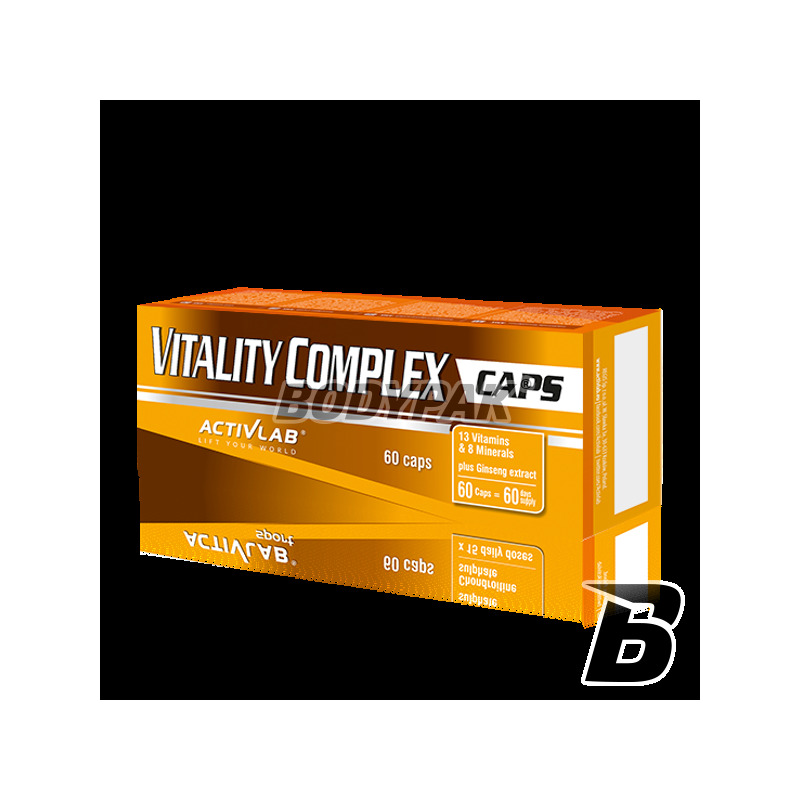 Vitamins & MineralsActivlab Vitality Complex - 60 kaps. 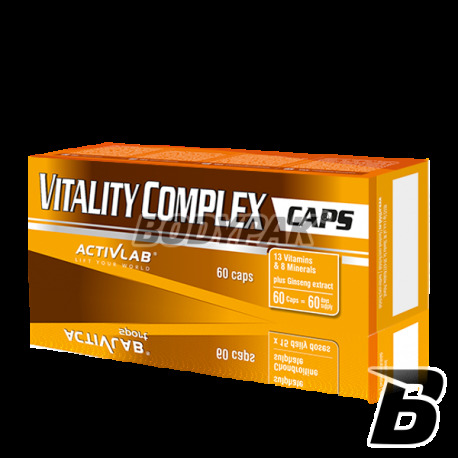 Activlab Vitality Complex - 60 kaps. Vitality Complex is recommended for people who are physically active, prone to stress, during convalescence, as well as in dietary deficiencies. COMPLEX OF VITAMINS AND MINERALS. Activlab Vitality Complex - The product is especially recommended for people who are physically active, prone to stress, during convalescence, as well as in dietary deficiencies. Energy: Included in the preparation of iron, B vitamins and chromium contribute to the proper energy metabolism, providing you with an appropriately high level of energy throughout the day! Condition: Vitality Complex is the ideal solution in a period of intense physical and mental effort. Highest quality ingredients give your body the best support in the period of increased activity. Ingredients: vitamins (l-ascorbic acid, nicotinic acid, DL-alpha-tocopheryl acetate, retinyl acetate, cholecalciferol, calcium D-pantothenate, pyridoxine hydrochloride, riboflavin, thiamine mononitrate, folic acid, D-biotin, phylloquinone, cyanocobalamin) Mineral components (iron sulfate II, zinc sulphate, copper sulfate II, manganese sulfate, potassium iodide, sodium selenate IV, sodium molybdate VI, chromium chloride III), ginseng root extract (Panax ginseng), anti-caking agent: magnesium stearate , Capsule (gelatin, dye: titanium dioxide). Jeśli szukasz najbardziej potrzebnych witamin oraz minerałów to ten produkt Ci je zapewni , wszystko co potrzebne w jednej kapsułce , gorąco polecam cena do jakość na doskonałym poziomie . Brak chorób, lepsza regeneracja, większa odporność - brać w ciemno! Dobry wybór w okresie jesienno-zimowym. Skład nie powala dawkami, ale zazwyczaj wystarcza. Dobry i przemyślany kompleks witamin. Spokojne są w stanie uzupełnić niedobory i wzmocnić organizm. Systematyczne zażywanie poprawia odporność na zachorowania w okresie jesienno-zimowym. Swanson Triple Magnesium Complex 400mg - 100 kaps. The innovative formulation based on 3 chemical forms of magnesium! The high digestibility and specific dose makes fast will complete its possible shortage. Helps combat the effects of stress, it eliminates uncontrollable muscle tremors. BioTech Zinc MAX - 100 tabl. Zinc is one of the most important minerals for the proper functioning of your body - affects many metabolic processes, adequate testosterone levels and overall vitality. Ideal product to supplement his deficiency! Swanson Natural Vitamin E 200 IU - 100 kaps. Natural vitamin E in a solid dosage! It supports the proper functioning of the eyes and muscles. This is attributed to its positive impact on fertility behavior. If you are constantly tired, you have problems with your teeth and bones? It is possible that you have a deficiency of this important vitamin! Trec Vit. C Strong 500 [witamina C] - 100 kaps. Vit C Strong 500 is a dietary supplement containing an increased dose of vitamin C, enriched with a complex of citrus bioflavonoids and zinc! Support your health! UNS Selenium - 30 tabl. Olimp B12 Forte bio-complex - 30 kaps. The maximum dose of vitamin B12 in each serving. Top-quality preparation recommended especially for athletes. Support your body! UNS Vit. D3 - 90 kaps. High-quality vitamin D3 in the form of capsules. A solid dose, up to 2,000 IU per serving! Supports the proper functioning of the immune system, pooprawia calcium absorption but also regulates proper functioning of muscles. Bet on sophisticated solutions!